This is honestly one of the quickest, easiest but funnest Christmas recipe I've attempted so far. I've seen different variations of this recipe on Pinterest over the last few weeks so I decided to give it a go myself! The biggest thing for me when looking for festive recipes is both taste and aesthetic. I love preparing a food selection that looks so Christmassy and tastes divine! Of course when i came across this recipe I was instantly attracted to how it looks! These Krispy Christmas Trees are the perfect addition to a dessert table or buffet, or for a quick snack!! - Sugar Decorations of your choice. 1. 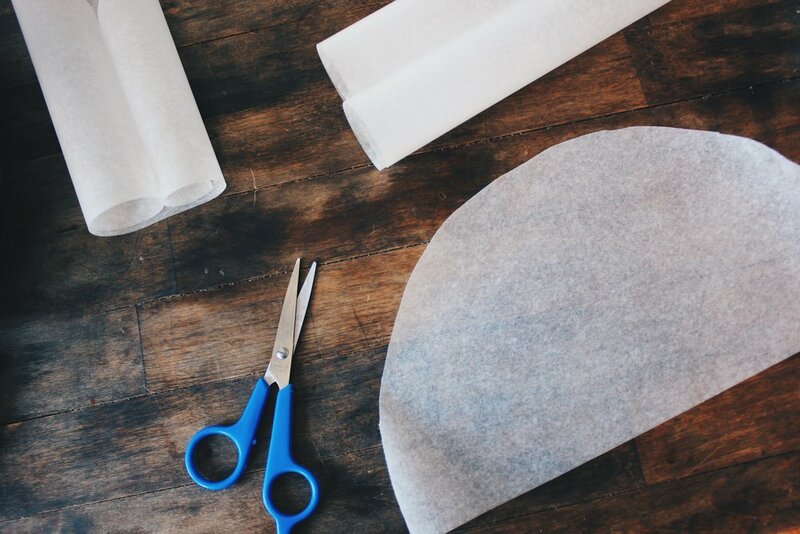 You'll want to cut out big semi-circle shapes of wax paper and fold them into cones. From the middle point of the straight edge you can begin to make the point of the cone. Use tape to hold the cone in shape. 2. Next you're going to want to take your white chocolate and melt it. You can either quickly zap it in your microwave, or melt it over a pot of hot water. I prefer to use the latter so that it doesn't leave your chocolate tasting like the inside of a microwave! 3. Add a few drops of food colouring. It is good to at a few too little drops at first so that you don't over do it. If you want your Christmas trees to be a little darker, add more drops. 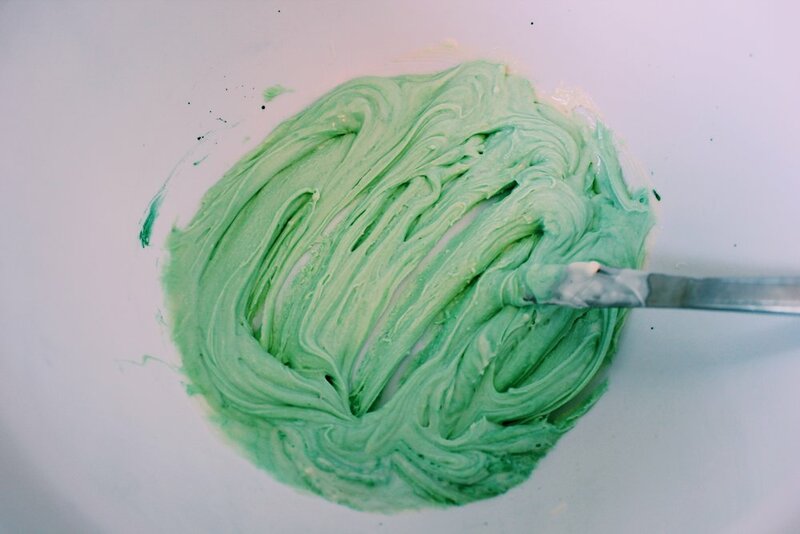 Stir until you have the colour green you want and it is fully integrated into the white chocolate. 5. Chuck you rice krispies into the melted chocolate and mix until they are completely covered. At first it is going to seem like they will never be fully covered but keep going until they are! 6. 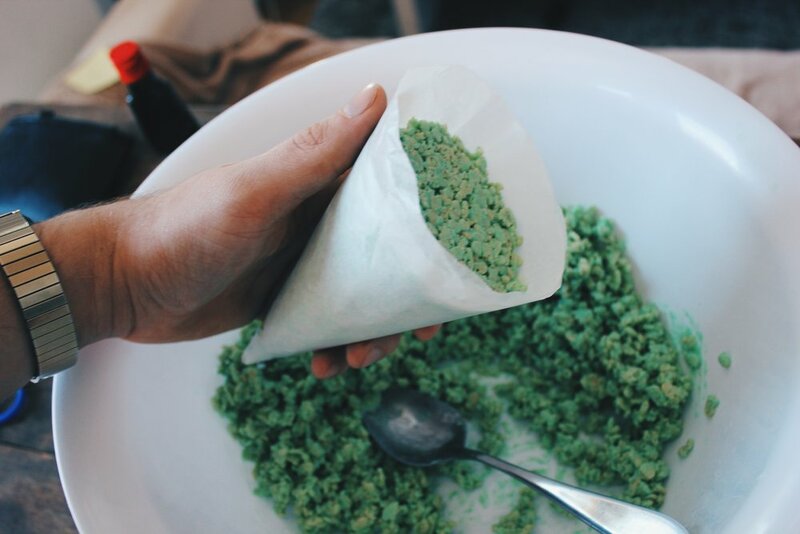 Spoon your rice krispies into your cones, making sure to pack them in tight to form a solid shape. It is crucial that you smooth the base of the cone so that the trees are able to stand up once removed from the wax paper. 7. Place the cones, point down in either glassware or tupperware and place in the freezer for one hour. After, remove the wax paper and you will have your trees! 8. Now its time to decorate! You can find seasonal or decorative sugar sprinkles and shapes at your local grocery store. Gino and I found these diamond decorations at target for $1.99! 9. To get the decorations to stick I simply mixed a tiny bit of water with some icing/confectioners sugar and made a thick and edible paste/glue. You can then go crazy and stick the decorations on like baubles on a Christmas tree! 10. Dust off your masterpieces with some confectioners sugar to replicate a light sprinkling of snow. And there you have it! I loved doing this recipe and thought it worked really well without taking too long to perfect! Give it a go and be sure to tag your pictures with NevNYC on Twitter and Instagram so I can see them!